One of my favorite methods of studying has always been dispersing the studying through my day randomly. I would put a set of flashcards in my pocket and look at them whenever I had a few seconds to spare. Using that strategy it was virtually pointless to sit down and worry about studying. I suspect this works well because study time is usually the worst time to study. It’s hard to remember boring information. Most of studying for most students is insanely boring. That makes trying to remember information an absolutely miserable chore. Your brain doesn’t care to remember the information because you’re giving it every reason not to care. (You’re sitting still. You’re not eating. You’re not reproducing. You’re not getting feel good hormones from anything.) You’re making the information completely unmemorable. When you’re waiting in line at a store or something, your brain was being stimulated seconds before. It was looking at stuff or people around you. There may be sounds that catch your attention. All these things can be memorable for your brain. Randomly introducing study stimuli during those moments increases the chance you’ll remember them compared to a boring afternoon sitting at a desk looking at a textbook. 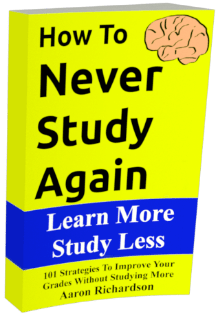 On this blog I try to teach how to make study time a better time to study. Using certain strategies during study time can make it more efficient but if you had the discipline (and nerdiness) to study randomly through the day, you’d rarely even need an official study time because you’d already be done with most of it. This is a really interesting method of studying! I’ve never considered it before. I always avoid studying till the last possible moment. My question is, do you make the flash cards yourself or do you buy them? It seems like quite a hassle to make cards for every lesson. I have used this technique and it has worked amazingly for me, along with sporadic studying I also study main concepts 15 minutes before I go to sleep. With these two studying techniques my grades have improved and my studying time has decreased! Wow, this is so great because I feel now like I’m not the only one with this problem, I have a really big disorder in studying, I sometimes can’t study at home and I must go to the library, what should I do to be more motivated to learn at home?